On December 13, 2005, the Wisconsin Supreme Court heard oral arguments in Landwehr v. Landwehr, 2003AP2555. The case presents the issue of the proper standard of review when determining a motion to modify physical placement. Let’s hope the high court relies heavily upon a recent court of appeals opinion before rendering its decision in this case. Landwehr focuses squarely on two statutes that seem to conflict. The prejudgment statute, Wis. Stat. § 767.24(4)(a)(2), requires a court to set a placement schedule that maximizes the amount of time a child spends with each parent. Meanwhile, the post-judgment statute, Wis. Stat. 767.325(1)(b)2, presumes that the current allocation of physical placement is in the best interest of a child. 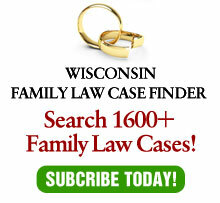 The issue arises from the 1999 change in Wisconsin custody and placement laws. The statutory changes began as an effort by fathers’ rights groups to mandate equal placement of children. The eventual legislation represented compromises which encouraged, but did not mandate, equal time sharing. See Keller v. Keller, 2002 WI App 161, 256 Wis. 2d 401, 647 N. W. 2d 426. In Landwehr, the District IV Court of appeals held, in an unpublished, per curiam decision, that the trial court, Milwaukee County Circuit Court Judge William Sosnay, properly exercised its discretion when it increased the husband’s placement of the parties’ minor children, but did not equalize it. The appellate court held that the requirement under Wis. Stat. §767.24(4)(a)(2) that a court must set a placement schedule which “maximizes the amount of time the child may spend with each parent” does not presume or require equal placement. The court noted that in order to maximize placement with one parent, a court would have to minimize it with the other. The decision did not discuss the apparent conflict with Wis. Stat. §767.325(1)(b)2. The court of appeals, however dealt with this issue in Abbas v. Palmersheim, 2004 WI App 126, 275 Wis. 2d 311, 685 N.W.2d 546, which, inexplicably, is not even cited in Landwehr. In my article critiquing that decision (See “Status Quo Statute Bumps Heads With Statute Pushing Joint Custody”, Wisconsin Law Journal, July 21, 2004), I agreed with the result, while questioning the court’s reasoning. As I stated in that article, while it is highly doubtful that the Legislature ever thought about the conflict between the two statutory provisions, the result in Abbas succeeds in promoting the best interests of children. In the oral arguments in Landwehr, the attorneys dissected the statutes involved in the context of the best interests of the children. As the court of appeals noted, it is impossible to maximize time with one parent, without minimizing with the other. Placement of children is a zero-sum game. The Supreme Court needs to keep in mind that initial placement orders differ from modification orders. By making modification of placement difficult, the legislature has preserved stability for children. If modification were easier, continuing placement actions would be encouraged. Where the interests of parents and of children collide, it is the children who should be paramount. This would best be accomplished by adopting the holding of the court of appeals in Abbas in the current case before the Supreme Court.